While I may not have been keeping up very well with the site, that doesn’t mean I haven’t managed to read a few books this year! I’m still hoping to get more detailed reviews up, but in the meantime this is what my 2018 GoodReads Challenge looks like. I really wish I were the type of person who could do audiobooks, but for some reason they continue to put me to sleep, no matter who the reader is or what I’m reading. If you have a suggestion for me about audiobooks I’d love to hear it! I feel like I could optimize my time better if I were listening along to a novel instead of just filling that space with xyz background noise. One of my goals this year was to read books written by Canadian authors, and as you can tell by my list, I’ve managed a couple. My favourite would have to be American War, but there’s lots of time left in the year for that to change. I’ve been using CBC reads to find Canadian authors that I’ve never heard of before and so far it’s working out wonderfully. I love branching out with my book genres and I hope I continue to find amazing new authors that I’ve never read before. What are you currently reading and how is your GoodReads challenge stacking up? I do hope to complete 50 books this year, but with a new baby on the way (due end of July) we’ll just have to see how things go. I know, I have fallen behind in posting to this site for many months now, the last one being back in July 2016. I didn’t even write at all in 2017, even though I did read books. I can’t promise that I’ll be any better about it in the upcoming months but I do want to try. I set myself with a new reading challenge over on GoodReads for 2018, last year I managed 30 books which seemed a bit abysmal for someone who enjoys books as much as I do. Sure, things are busy, but even just a few minutes before bed can allow you to get some wonderful reading done. So this year I’ve decided to aim higher, 50 books. 50 is what I would ‘typically’ read before having children, before moving to a new province, before my life became the complicated mess that it is these days. I am not sure if I’ll actually make it, but I am sure going to try. That’s approximately one book a week (give or take a few days) and so far I’ve managed two books for 2018. I don’t want to force myself, but on the other hand I don’t want to continue to fall so far behind, either. Along with that new reading goal I decided that I wanted to read more Canadian authors, so I went to CBC Books and looked up what books people were talking about. My first two 2018 books were both by Canadian authors, and I’ll be talking about them more in the upcoming days (hopefully, again no promises). I’m trying to decide what I want to read for my third book of the year, something a bit different than what I’ve been reading I think (I’ve stuck to a lot of plain fiction). Hopefully putting these goals down in text here on the site will inspire and motivate me to actually get the reading done (and the writing). I’m sorry for slacking so badly over the past year, and I can’t wait to share what I’ve been reading with everyone. Reading can be an expensive hobby, especially if you like to read books by your favourite authors as soon as they come out. So what about the time in between those authors when you’re still craving a book to read, but don’t necessarily want to shell out $20+ per book? Don’t misunderstand me here, I certainly believe that authors should be paid for their work, and being a writer myself I understand the enormous amount of work that goes into a publication, but I’ve also always been a big supporter of reading and I believe that it should be made available for anyone out there who wants to read no matter their financial standing – thankfully this day in age, with today’s technology, there are many options for low budget reading. You may not always get triple A reading material, but you’ll certainly find some gems. One of the first things I did when I got my kindle e-reader was browse through the kindle store. It’s pretty easy to get lost, but they have a nice selection of books that are free for you to read, usually the classics. There’s tons of classics out there. If you’re not a fan of using amazon there are other options. One popular one is Project Gutenberg. A good one for free audio books is LibriVox. 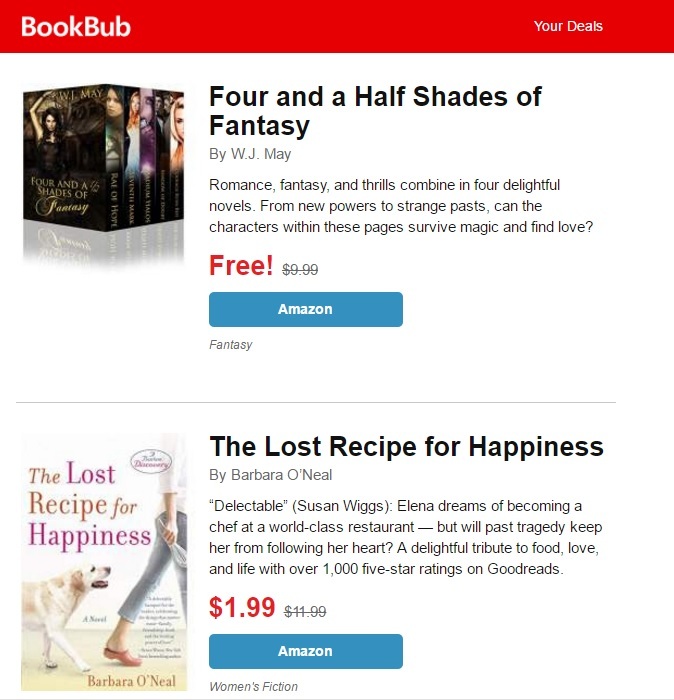 Every day I get an email from BookBub and in this email they typically list a bunch of highly discounted books along with one or two free ones. The free ones are not free forever, they’re usually on some amazon deal that lasts a day, a week, or longer depending on the author. This is where you’ll see a lot of “not so great, but hey it’s free” books listed – and it’s a great place to find potential gems. The books are different every single day and this is probably one of my favourite ways to get free books and add to my e-book collection. If you’ve never checked it out before, I highly recommend signing up. One thing to note, if you check off any of the romance books in your preferences, chances are your daily email will be filled with that type of book. It just happens that there’s a large number of them, and they go free pretty often. I’ve got 14 free books in the lats 6 months according to my amazon orders placed, and while they certainly haven’t all been winners, they’re not always horrible and it’s a great way to do some budget reading. There are also a lot of sites like this one that will list all of the current amazon books that are marked as free. If you’ve got a book review site, a blog, or even just like to write reviews for Goodreads there are even more options for you. You can sign up for a site like NetGalley and apply directly to publishers to read and review the books they have listed. In this case you’re much more likely to stumble across books you will really enjoy since you’re hand picking which ones you review. The books here are all represented by a publisher, and are not self published. Of course the downside in this case is that you may be declined by the publisher, especially if you don’t match the publisher’s requests. There are rules for this type of review, they have to be done in a specific time, and sometimes location is a factor. Publishers may only be looking for reviewers in the US, or in Canada, based on where their book is being released. I’ve talked about these options before, but if you’re a fan of bundles, there’s the HumbleBookBundle that runs pretty frequently, though you may need to wait until you see books that you enjoy come up. They change each bundle, and the prices are fantastic. There’s also StoryBundle which supports Indie authors. Their bundles are less frequent, so you may want to sign up so you can get notice of when they run. Another choice that is slowly making its way across cities is of course – your public library. Now this will absolutely depend on where you live. When I was in Ottawa I was able to sign out ebooks from the library web site and download them to my e-reader. Now that I live in a more remote area, I don’t have this available, and I miss it. Not all books will be available this way, and you still have to abide by library rules (they can only lend out as many “copies” as they own, and there may be a queue) but it’s a newer option that I really enjoy seeing come to life. Have more suggestions for readers on how to get some budget ebooks? Don’t hesitate to leave a comment with your suggestions below! The start of a new year is a great time to find motivation to do all sorts of projects that you may not otherwise think about. That includes promising to do more reading, too. Lately book talk has revolved around Emma Watson starting a book club on goodreads that anyone can join. Not only is this fantastic motivation from a celebrity but she’s ready some pretty amazing books, too. She clearly states that the club is going to focus on books about equality, as it pertains to her work with UN Women. 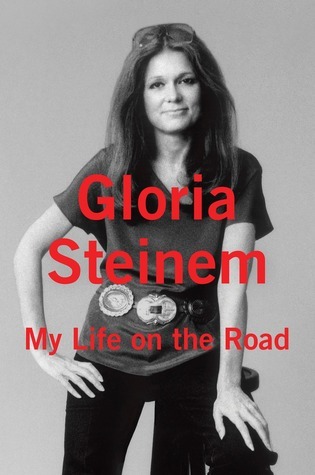 The book club holds the logo “Feminism is for everyone” and the first book up for discussion is ‘My Life on the Road’ by Gloria Steinem. I have been wanting to expand my reading and so I joined the reading group and I also picked up the book this weekend. I haven’t gotten very far into it yet, but I’m excited. The group has over 80,000 members which does make for incredibly busy discussions. I don’t plan on participating a great deal but I will lurk and read some of it. A lot is nothing to do with equality or women’s rights at all, but are Emma stalkers, hoping that she’ll open communication with them. We need more book clubs like this. They don’t necessarily have to be the exact same subject, but we (society) needs to be encouraging people to read and we need to offer motivation for people to branch outside of their comfort zones in what they read – without judgement. I don’t care what people are reading as much as I care that they ARE reading. The club seems to be very well rounded. There are some members who have read thousands of books and recorded them to Goodreads, and others who have only one or no books recorded. I’m interested in seeing what books make the list, and what others think about them. How about you, do you belong to a book club? Each year I like to challenge myself with reading books. The past few years have felt less like a challenge and more like a goal I knew I could easily reach. 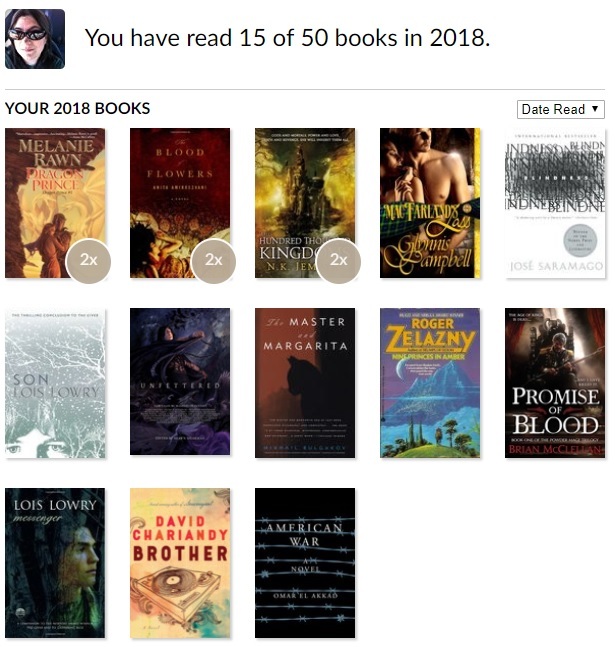 My first year completing was 2013, and I set my goal to 30 books, and ended up reading 36. 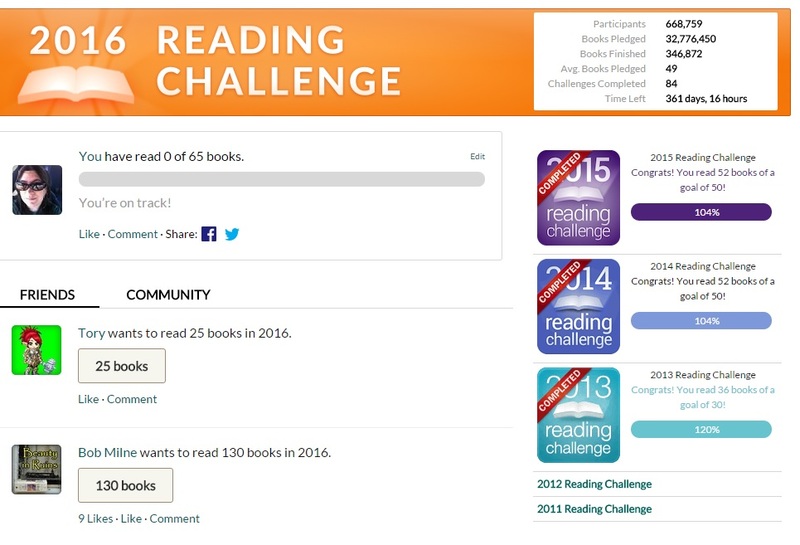 The following two years I set the challenge to 50 books and read a total of 52 books for the year. This year, 2016, I’d like to really challenge myself, and so I’m setting my goal to 65 books for the year – and I’d like half of those books to be audiobooks. You may think that sounds a bit strange, purposely listening to audiobooks rather than choosing to read the books, however I think it’s a great goal for myself. These days I spend a lot of my spare time knitting and while I’m good at knitting, and reading, I’m not (yet) good at doing both at the same time. There are actually people who can do that, read and knit at once, but I am (so far) not one of them. I’d like to be able to fill that spare time with audiobooks. Where to get these audiobooks was my next decision. There’s Audible which is one of the largest suppliers, but I’m not sure if I want to dedicate $14/m to a subscription or just pay as I go. I believe the $14/m only gets you a single book a month, and that’s certainly not going to be enough for me. Audiobooks are typically more expensive than regular books though there are free versions out there. The problem with free versions is you never know if the reader is going to be someone you can tolerate, and depending on the software you use it’s very easy to lose your place. I’ve signed up for kindle unlimited to test out the audio narration whispersync feature, I’m hoping it may be a good alternative to someone like me who doesn’t mind spending money on books or subscriptions, but who has a limited budget. Have you set up a reading challenge for yourself this year or do you prefer to just take books as they come? Let me know in comments! To say I’ve neglected this site over the year would be an understatement. I had every intention of keeping up with my reviews, but it just didn’t happen. Work, life, everything seemed to have gotten in the way. I did manage to read quite a few books for 2015, completing my goal of 50, but I want to make a resolution to post more often in 2016. I know I can do it if I just set aside some time each week. I love books in all of their forms and it was important to me to be able to share that love in my little corner of the internet. I suppose on some levels I have been discouraged, I see so many larger sites receiving books to review and I know I can’t compete. I don’t like to spoil books for others so my reviews are lacking a lot of details. Perhaps I should focus more on those details and not so much on keeping things spoiler free. I’m not sure what my goal will be yet when it comes to writing here, but I’m hoping that at least bi-weekly will be something I can manage. Even if it’s not a book I have finished reading, but rather a generic article about the subject. Most of the writing here isn’t for anyone in particular but is for my own pleasure, but I do want to have at least something to show for it. What is next on my to-read list? I haven’t quite decided. I think I’d like to write a few reviews of some of my 2015 choices that I’ve neglected to write about and then we’ll just have to see where I end up. Some books surprised me a great deal, and were nothing like what I expected. I want to be able to share those thoughts with everyone. Happy reading – here’s to 2016! I read this book back in February and am only getting around to finishing up my review now. Bad, I know. I wanted to like it. I wanted to love it. I read reviews and saw people promoting it everywhere. Thing is, I’m just not a fan of the genre. 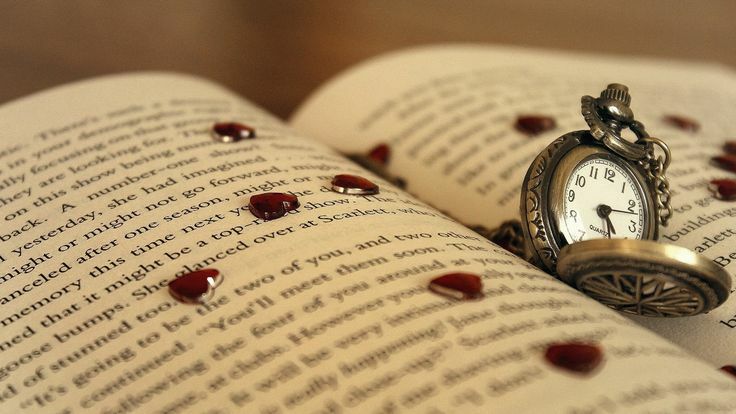 The book begins with the end of the world. The georgia flu kills 99% of the population and changes everything about the world as we know it. The book swaps between the past and present, Kirsten (present) is touring the wasteland with a group of musicians and actors, bringing entertainment to scattered settlements, and Arthur Leander (past) is playing a part in King Lear on stage in Toronto. Well, he is at least until he has a heart attack and dies on stage. The book’s main motto is “survival is insufficient” – a tattooed immortalized line from Star Trek. Of course the book has a prophet, there has to be some turmoil besides the survival of mankind. 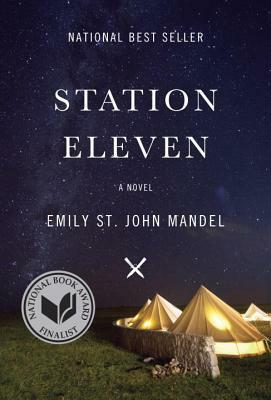 The characters are detailed and driven, and that was the one redeeming fact I found. Despite the fact that it was well written, detailed, colourful and depicted humanism in a very frank and lovely way – I just couldn’t get into this book. No matter how hard I tried, I wasn’t captivated by the story. I do not think this is at all the fault of the author, but some books we find interesting and others we simply don’t.